Top Left - weighing rice with scales with various scoops. Very simple and she really enjoyed it, especially watching the arrow on the scales move. 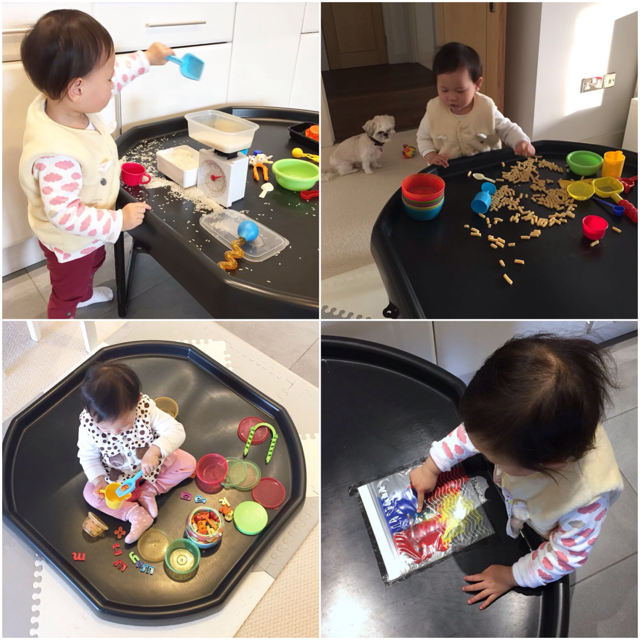 Bottom Left - this was her very first tuff tray activity, scooping magnetic letters in and out of pots. She sat there playing for almost an hour because it was new and something she's not done before. Bottom Right - I think we done this a little late or she's just not interested. I think everyones done this one putting paint inside an IKEA bag then taping it down and you use your fingers to move the paint around to mix the colours and feel the paint move. I added some pumpkin seeds inside also for texture. She only played with it for a bit and got bored very quickly....maybe because it was no mess?! If you missed my previous Tuff Tray Activities posts you can catch up below!